The Lone Star state is dotted with charming bed and breakfast inns, from Galveston on the Gulf of Mexico to El Paso to Amarillo. Texas, the second largest state in the U.S., is a diverse and beautiful country. Staying in a bed and breakfast can be a great way to learn about the state's history, its people, its food, and its sense of humor. The Texas Gulf Coast stretches from Brownsville, at the Mexico border, to Port Arthur and Beaumont, at the Louisiana line. The over 400 miles of coastline include quaint seaside towns, beautiful white sand beaches, and classic plantation-style architecture. 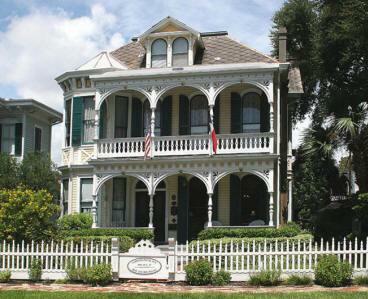 Coppersmith Inn - This Victorian-era bed and breakfast located on Galveston Island was constructed in 1887 as a private dwelling. The inn offers five guest rooms, including three suites in the main house as well as cottage and carriage house accommodations. Each room has a private entrance and porch. 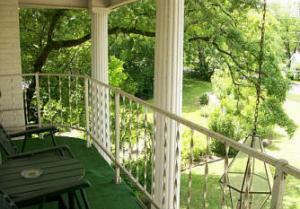 The inn features 14-foot ceilings, 19th Century architectural features and lush gardens. Each guest room has free wi-fi, cable television, a DVD player and additional amenities. The Texas panhandle region sits in the northern part of the state, between Oklahoma and New Mexico. The relatively flat prairie country includes the major cities of Amarillo, Lubbock, and San Angelo. 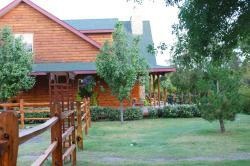 Three Falls Cove - Dubbed a "country inn bed and breakfast" by its owners, Three Falls Cove is located in Sanford, Texas about 50 minutes outside of Amarillo. Guest accommodations are available in a lovely five bedroom lodge - each room with its own bathroom - as well as a rustic private cabin. Guests can enjoy a complimentary full breakfast each day of their stay. Rowboat and paddle boat rentals are available for an additional fee. Texas' prairie country, in east-central Texas, is one of the state's most populated regions. It includes Dallas, Fort Worth and Waco, as well as a dozen small scenic lakes and miles of sweeping grassland. Azalea Plantation Bed and Breakfast - This Fort Worth bed and breakfast features four guest rooms in the main house and two cottages. Accommodations include flat-screen televisions with cable, free wi-fi, an iPod charging dock, and more. Guests can enjoy a full breakfast buffet daily as well as complimentary cookies, bottled water and tea. Guests can also arrange for on-site massage therapy for an additional fee. The inn is located close to popular local attractions such as the Historic Stockyards District, Sundance Square and the Fort Worth Zoo. 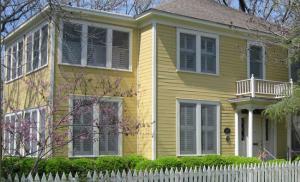 The Corinthian Bed and Breakfast - This lovely bed and breakfast provides comfortable accommodations in a charming historic home near the hustle and bustle of downtown Dallas. The inn features five lovely guest suites, each of which includes a private bath. Additional amenities include both wired and wireless Internet access, a television, a hair dryer, a bathrobe and more. The facility is located in close proximity to excellent shopping and dining options, as well as attractions like the Dallas Museum of Art and Old City Park Historic Village. The Texas hill country, in the south-central part of the state, includes the state capital and cultural center of Austin as well as the home of the Alamo, San Antonio. The cities are surrounded by pristine lakes and rolling hills, perfect for an escape to the countryside. The Oge Inn - This historic antebellum home sits right on San Antonio's scenic Riverwalk, just a short stroll away from shopping, restaurants, and the Alamo. The inn has five guest rooms, all with private baths, air-conditioning, period antiques, and luxury plush towels and bath products. Most rooms have wood-burning fireplaces and each of the home's three floors has a large front porch overlooking 1.5 acres of a beautifully kept lawn and garden. 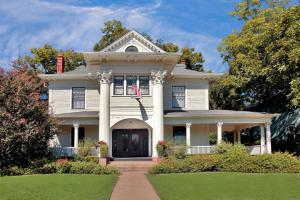 The Adams House - This Greek Revival Texas bed and breakfast is located in Austin's historic Hyde Park district, within easy walking distance to the University of Texas, museums, hiking and bike trails, and numerous shops and restaurants. Five guest rooms are available. Each room has a private bathroom and is stocked with complimentary bottled water. The home boasts spectacular architectural details, such as pine floors, two wraparound porches, 12-foot ceilings, and original fireplaces. No-cost wi-fi is available on-site. No matter what part of the state you visit or which bed and breakfast you select, you're sure to have a great time when you plan a relaxing weekend (or longer!) getaway at a charming inn. Be prepared to get away from it all in comfort and style with a bit of pampering and old world charm the next time you can fit a Texas-style B&B escape into your busy life.